On 30 November 2014 you are summoned to exercise your constitutional right to vote for a new parliament of Moldova. It is important that we all understand one simple, but fundamental thing: our, our children and grandchildren's future depends on that the way we vote on 30 November. Now our fate is being decided. Throughout Moldova’s history we had 3 opportunities to make the decisive step towards Europe, an land of freedom, prosperity and security. We had the first chance in 1991-1993; the second one - in 1998-2000. We wasted those opportunities, voting for anti-European forces. We paid for our decisions. The country and people were impoverished, and many of them left abroad in search of a better life. Moldova lagged behind the former communist bloc states that have chosen the path of development, and joined the European Union. Now, history offers us this chance for a third time, for us to align with all the civilised peoples of Western Europe. It is our duty to live up to this historic moment, to fulfil our civic mission. Europe supports us politically, financially and economically. All that remains is for us for us to confirm our adherence to the European course, to be consistent; to overcome the grievances of the moment, to stand united against those that do not wish us well. Democracy in our country in this electoral period is used by some competitors to manipulate and divert us from the country’s normal course of Europeanisation, modernisation of society, a course we voted for in 2009 and 2010. Political forces participate in this round of elections, forces that want us to return to our troubled and shabby past from which we separated with great difficulty, with enormous exertions and great human sacrifices. Dubious, unknown people and parties, financed by suspicious and foreign sources, are now talking to us about the new customs union and illusory Asian projects, attacking the European foundation our country is built on. 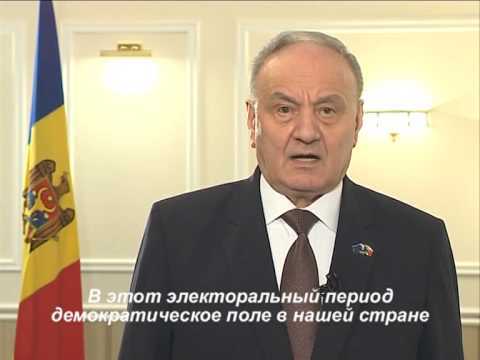 I have never heard these false politicians asking the foreign armed forces to withdraw from Moldova, or to express disagreement with the ban on exports of agricultural products during the full harvest season! On the contrary - I saw them rejoicing when our country was subjected to trade embargoes. It comes as no surprise, since they are the ones to ask their masters abroad to impose these trading blockages. It seems that the slogan that best fits these anonymous politicians is: the worse it is for Moldova, the better it is for them! I stand before you to urge not to be manipulated by the forces whose aim is to bring Moldova to its knees in a permanent state of poverty and insecurity. The transformations we have gone through in recent years have brought a breath of fresh air in our country and visible results in all areas. Moldova is changing. Hundreds of kilometres of new roads, dozens of public institutions - schools, kindergartens, medical centres and other renovated social facilities buildings - improved public services, and more, are proof of this. This year we started to travel freely in Europe. There is a risk of losing this right nonetheless, if we do not support the pro-European project. I believe in our chance to make Moldova a prosperous country, where there are well-paid jobs in which children are cared for and properly educated at home by their parents, who do not need to leave and work abroad. Our neighbours in Ukraine gave us an example, several weeks ago, choosing a pro-European parliament and government. Let us follow this example, so we do not end up on an isolated island between two pro-European neighbours, Romania and Ukraine. I thank you and I believe in your wisdom. Let us vote for a European future together! "